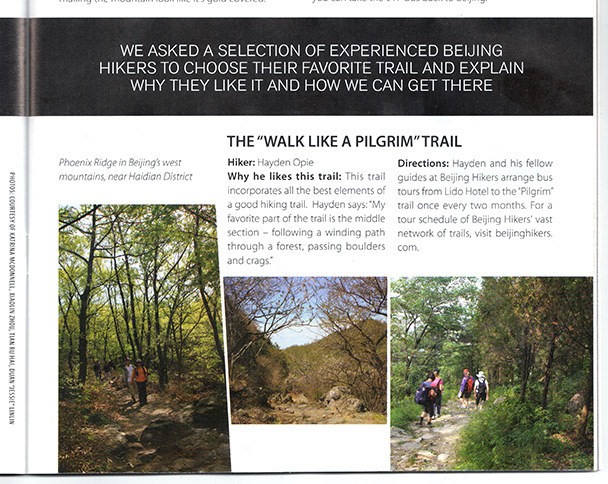 In Brief: We contributed to the Beijinger magazine’s The Great Outdoors issue in August 2014. See scans from the magazine and some extra information. 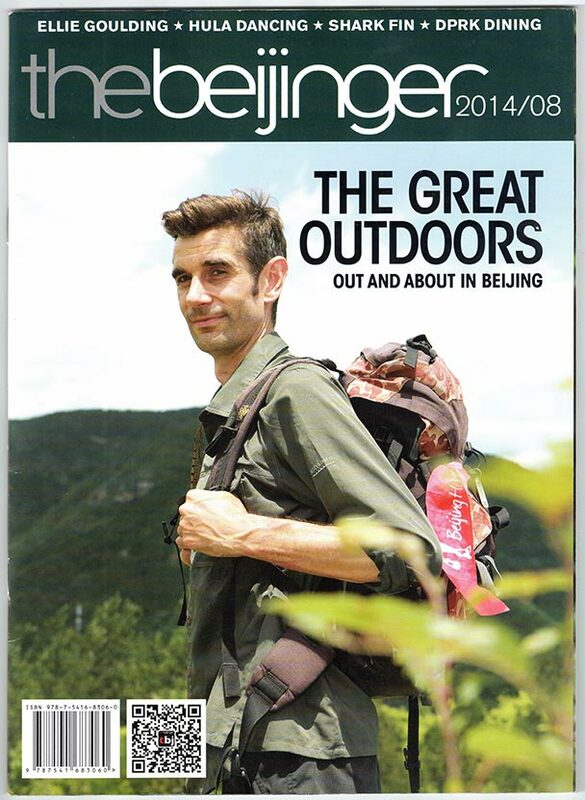 The cover story of the Beijinger magazine’s August 2014 issue was The Great Outdoors, and contained tips from various experts and enthusiasts for trails and places to hike and camp in the hills around Beijing. We offered our opinion and helped the Beijinger crew find a nice place for a photo shoot – they ended up putting us on the cover, which you can see below. Thanks, Beijinger magazine! You can read the digital version of the Beijinger August 2014 issue here. After the scan of the cover and our part of the article, we've included some of the information that didn't fit in the final version of the article, if you're curious about that. Now for the extra information. Hayden, Beijing Hikers: We call it Walk Like a Pilgrim, because the trail follows an old path between temples, crossing Phoenix Ridge in Beijing's West Mountains. The trail goes between two villages: Che'erying Village (车耳营), in Haidian District, and Miaofengshan's Jian'gou Village (涧沟村), in Mentougou. Jian'gou Village is a lot higher up than Che'erying, which means the trail is easier if you start from there - after crossing the ridge it's down hill for a long way. Not totally sure about this. There is bus service to Miaofengshan, and there's probably a bus to Yangtaishan, a park close by to Che'erying Village. To get to the trail head on the Miaofengshan side, you walk/drive from the Jian'gou Village carpark up the ashphalt road towards Miaofengshan Temple. A couple of kilometers up you'll see a turn on to an old concrete road, and the hill trail starts just to the left of that. Fire wardens may stop you between October-March, which is fire prevention season. Parts of the trail get very overgrown during summer. There are a lot of forks in the trail, and some of them dead-end or go to different villages - best to go with someone who knows the trail, or be prepared for an adventure! a) What do you love most about this trail and the destination that it leads to? My favourite part of the trail is the middle section, following a winding path through a forest, passing boulders and crags – it's peaceful, and you'll seldom see other hikers. On a clear day you have views of a large part of northeast Beijing's suburban area - Haidian District, and Changping County, plus mountains and hills all around. b) How good it feels to hike trails like this on a day off, especially after working and living in a concrete jungle like Beijing. Ha! I don't get days off very much. When I get a day off I can catch up on housework. It's my job to take people hiking, and I go out two times a week on average. I definitely get a bit crazy if I'm stuck in the city all week, and a lot of our regular hikers tell me they feel the same way. c) What do trails like this tell you about hiking in Beijing- how is hiking here unique? Trails like this tell you that there have been people living in Beijing for a long time. There are temples in the hills around Beijing that date back to the 11th century, and it seems there's always an old pilgrims trail that leads to them through the hills. Part of the trail on the Walk Like a Pilgrim hike was paved during the Qing Dynasty, with the construction funded by religious donors and one of Empress Dowager Cixi's favourite eunuches. Part of the paved path is still there to see, as well as the ruins of teahouses and old villages. Hiking around Beijing has an extra historical side that you don't always get in other places – as well as being able to get exercise and get out into nature for beautiful scenery, you can see parts of China's history – old temples, abandoned villages, and 500-year-old Great Wall that's still in really good shape.